Pox World Empire is a small up-n-coming label out of the Chapel Hill area that has been doing a fantastic job over the last few years of releasing some great pop music from North Carolina. Not since the mid-90s has there been this many good, young bands coming out of that fertile crescent of indie rock. 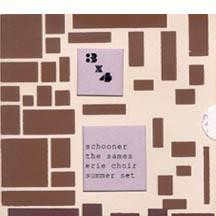 This compilation features three songs by four of these bands – Erie Choir, Schooner, The Sames, and Summer Set. After having listened through this a few times now, I can honestly say there isn’t a bad song on this collection…and the last time I was able to say that about a various artists compilation was, well, never. A brief rundown of the groups is as follows – Erie Choir make me think a little of the Czars, pop songs with an Americana underpinning to them. The Sames offer a more urgent, upbeat sound than the other three bands – more guitar-driven, not dissimilar to the more recent Superchunk/Portastatic versions of pop songs. Schooner bounce around different versions of the laid-back pop sound, with country-tinged moments and the best song on the compilation with “Birds and Other Creatures”. Summer Set rounds out the group, providing an electronica/pop hybrid that leans more towards Kingsbury Manx with synths or the Alan Parsons Project than it does Postal Service. Truly all quality bands that most anyone could enjoy.